The kind folks at IDW Publishing have supplied ComicList with their solicitations for comics and other products featured in the June 2018 Previews, scheduled to ship starting August 2018. 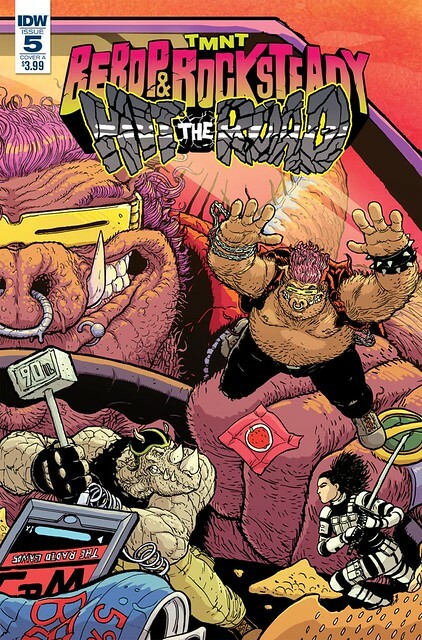 • The sequel to the hit TMNT: Bebop and Rocksteady Destroy Everything! • The most insane TMNT tale of the year and possibly ever! • Variant covers Cory Smith, and Kevin Eastman! When Bebop and Rocksteady run into a major roadblock, they're forced to do the unimaginable—get real jobs! •	Variant cover by Ulises Farinas! Time-travelling menace Savanti Romero returns to enlist Bebop and Rocksteady again… but he's brought a whole heap of trouble back with him from the 79th dimension! •	Variant cover by Giannis Milonogiannis! Bebop and Rocksteady's trail of destruction has got them a lot of attention… including from the government who's sending an army to stop them! •	Variant cover by Buster Moody! •	Variant cover by Aaron Conley! Leatherhead returns to New York, and this time, he's got one goal in mind—the destruction of the Turtles! • Fan-favorite character Leatherhead in a battle with the TMNT like we've never seen before! • Variant cover by David O'Sullivan! • Amazing painted art by Nelson Daniel! • Variant cover by Tom Velez! This is it! Fans demanded it and IDW Publishing listened! The entire TMNT Volume 3, reproduced for the first time ever in full four-color glory! As all-out war wages between his brothers and the forces of Warlord Komodo, the most mechanically minded of the Turtles returns—as a living machine! And you'll never believe whose side he's on! • Featuring new cover art by Frank Fosco and TMNT co-creator Kevin Eastman! • Variant cover by Kevin Eastman! A thorough look back at the TMNT's comic book origins with their first stories plus insightful annotations from co-creators Kevin Eastman and Peter Laird. Rediscover the underground roots of Teenage Mutant Ninja Turtles, with this special collection of Mirage Studios' issues #12, 14, 15, 17, and 19–21 including the stories "Survivalists," "The Unmentionables," "Dome Doom," and the multi-part "Return to New York." This series is perfect for fans to relive the glorious days of the Turtles' origins as well as an excellent place for new readers to see where the TMNT phenomenon began. • The best-selling hardcover series now presented in paperback. Boo has traveled far and wide as companion to Minsc the Beloved Ranger, but there comes a time in every hamster's life when they must stand alone and face the darkness. If you read only one comic about a miniature giant space hamster this year, make sure it's this one! • Variant covers by Adam Kosh of Code Name, and Max Dunbar! • Presented in conjunction with ONI PRESS! • Patrick Rothfuss, the multiple award-winning, bestselling author of The Kingkiller Chronicle series, joins Dungeons & Dragons fan-favorite writer Jim Zub (Avengers, Wayward) on a tri-dimensional fantasy adventure! • Troy Little is the multi-Eisner nominated artist of Fear & Loathing in Las Vegas, Angora Napkin, and The Powerpuff Girls. • Rick and Morty is one of the most popular shows in Adult Swim history, with a steady fan following since it debuted in 2013. This is the first official Rick and Morty team-up story and should have deep traction in fan circles. • Dungeons & Dragons 5th Edition sales continue to grow each year and the Baldur's Gate video games have sold millions of copies around the world. D&D has returned as a cultural force in bookstores and online. • Variant covers by Sara Richard and Tess Fowler! "Special Missions," Part 5 (of 5)! G.I. Joe. Cobra. Two opposing forces. Two powerful war machines, each made more lethal by the undeniable strength of their individual parts. But who and what are those parts? Living legend Larry Hama shares some of their amazing stories in "Special Missions"—one-shot stories featuring a variety of characters and different artists to draw them! This issue, Harvey Tolibao (Dungeons and Dragons) joins forces with Larry to present G.I. Joe's fiery field commander without equal: SCARLETT! • Special oversized issue celebrating 100 issues of G.I. Joe: A Real American Hero at IDW Publishing! • Variant covers by Larry Hama, and John Royle! This omnibus edition collects the first 12 issues of the Marvel Comics run, introducing classic characters such as Hawk, Scarlett, Stalker, Rock 'n' Roll, Snake Eyes, Cobra Commander, Baroness, The Oktober Guard, and more. Follow along as Cobra wreaks havoc around the world and The JOEs thwart them at every turn. • The comic book adventures of the 1980s phenomenon that stormed toy-store shelves begins here! Having followed the Dire Wraiths across the galaxy to Earth, Rom finds they have infiltrated all levels of society, hiding in plain sight. Replacing many humans in key leadership positions, the Wraiths' plan to dominate the planet—and everyone in it—is gaining momentum. But Rom finds resistance from the humans as well, who fear he is just another alien invader. He is joined in the battle by two other Solstar Knights… but are they here as friends or foes? •	Variant covers by Nick Roche, and Francesco Francavilla! • The destruction continues! We're halfway to the end and Unicron is winning. Will Optimus and his allies be able to save anything?! • Variant covers by Guido Guidi and Francisco Francavilla! • Tie-in to the Unicron event! • Part of the summer of Transformers—all building up to the end of the universe as we know it! • Bringing the story to a close at long last—and everyone's involved! • Variant cover by Geoff Senior! • The first Bumblebee original graphic novel! • Bumblebee: The Movie premieres in theaters December 21st, 2018. Energon is Forever. It's war in the streets of swinging 1960s London, baby—and it's freaking Bumblebee out! The Decepticon scheme to lure the world's top espionage organizations into war shifts into high gear—so Bee and his super-spy friends call in some international help! • Black and white variant cover by Andrew Griffith! Crammed into a dead Decepticon astropod that's 10 sizes too small, the displaced crew of the Lost Light faces their most serious threat yet: each other. No worries though, Rodimus can save the day! Or maybe they'll all die... Plus, the Scavengers have never had it so good. The war is a receding memory, their patchy service records have been forgotten, and the five of them can roam the galaxy as they please. All's well that ends well? Not quite. Collects issues #13–18. • Winner of the Comixology Award for Best Ongoing Comic Series of 2017 as well as Best Writer for James Roberts! • From the creative forces behind Star Trek: The Next Generation—Mirror Broken and Star Trek Discovery—The Light of Kahless! • Variant covers by Elizabeth Beals, and J.K. Woodward! • Black and white variant covers by Max Dunbar, and Alan Quah! • Part of a yearlong celebration of The X-Files 25th anniversary! Cosima and Delphine's LEDA-clone-curing, globe-hopping adventure now takes them to Vegas and Portland, where they encounter something extra terrifying—meeting the in-laws! But there's much more sinister science afoot, and mysterious forces are conspiring against them. • Don't miss the themed Vacation B covers on each issue by Elizabeth Beals! The Ghostbusters need every missing ghost back to properly recalibrate their rapidly malfunctioning containment unit, and so far, they've recaptured them all! But this time, something stands in their way—and his name is Louis Tully! • The Ghostbusters mega crossover event continues here! • Variant cover by Brian Shearer! • Continues the storyline from the third and final film! • Join the Blue Blur for brand-new adventures as he and his friends race around the world to defeat the evil Dr. Eggman's robotic forces! • Fun for Star Wars fans of all ages! • Variant cover by Arianna Florean! • Go back to where it all began with this new take on the classic story. • With events faithfully brought from the film to the comics page, read along as Luke Skywalker embarks on his destiny, Princess Leia confronts Darth Vader, and the Rebellion fights for the fate of the galaxy! The saga that has mesmerized fans for more than 40 years begins again, right here! Tales from the heart of Duckburg and beyond! This volume collects stories inspired by the critically acclaimed Disney Channel series, as Scrooge and company face off against brand new threats—and a few familiar ones too! Scrooge and company deal with magical relics, dastardly ghosts, and one of Scrooge's greatest threats: a risk assessor from an insurance company! Plus, see the return of classic villains The Beagle Boys! This volume features six new tales from issues #6-8 of the ongoing series. • DuckTales the TV series has reached over 22.5 million total viewers! Hiro, Fred, Wasabi, Honey Lemon and Go Go continue the fight to keep their city safe—that is, when things aren't too hectic at the San Fransokyo Institute of Technology! Plus, a brand-new short story starring Baymax and Mochi! • Based on the upcoming TV series! • Variant cover by Anna Lencioni! It's a ho-ho-humongous collection of Disney Yuletide tales! Mickey and Uncle Scrooge battle Pegleg Pete and the Beagle Boys in "The Christmas Caper!" Then Daisy, Donald, and Gladstone have a not-so-jolly holiday in "Christmas Clubbing"—and Donald and Mickey save Christmas from the Phantom Blot in "'Tis No Season!" • Celebrate the holidays with Mickey, Donald… and Disney! After their second film, the children of classic Disney characters like Maleficent, Belle and The Beast, and the Evil Queen take on an all-new adventure from Auradon! Evie, Mal, Ben and friends begin taking classes in Sherwood Forest with other Auradon Prep students. In the forest, they discover that some of the skills they learned on the Isle of the Lost will come in handy, but the other students have talents of their own to match. And when they're split into pairs, they'll be reminded that teamwork is the key to success… AND survival! • Descendants is one of the most watched Disney Channel original movies of all time! Pinkie Pie finds a magical apple that gives her extraordinary abilities! Will she use her new power for good… or fun? • Pinkie Pie craziness cranked up to eleven! • Variant cover by Sophie Scruggs! • Detective dilemma meets family fracas! • Variant cover by Trish Forstner! The Imperial Library of Constantinople, home of the world's largest collection of knowledge, sits inside a maze locked in a fortress under constant guard. It's up to our crew of thieves and con artists drawn from across the Byzantine Empire to get in, steal four incredibly valuable texts, and escape without being caught or killed. Don't worry, it only sounds impossible. It's the crime of the century—the 11th century! • The deepest dive into the history of Atomic Robo's world yet! • Celebrating 10 years of Atomic Robo! A graphic novel adaptation of Nancy Springer's bestselling mystery series about Sherlock Holmes' resourceful younger sister! • Stranger Things star Millie Bobby Brown, who plays Eleven, is set to produce and star in an Enola Holmes feature film. • An all-new reimagining of the series! • Black and white variant cover by Brian Buccellato! Though his heart is broken, Antar fights hard to prove himself to his father and keep his nation free, all in the hope that Abla will hear of his deeds and not forget him. But is this task too great? The answers lie in the world of the djinn itself. • Written by Hugo and Nebula award winning author, Nnedi Okorafor! • Rodríguez won the 2015 Eisner Award for Best Limited Series, with Eric Shanower, for his work on Little Nemo: Return to Slumberland. • A Stephen King style road-trip movie combined with an apocalyptic doomsday tale, this story is both violent and melancholy, holding a mirror up to American consumerist society and human decadence. Shock and delight in spades as we stretch out the long, hot summer for all it's worth and bring grand conclusions to Tales from The Black Crown Pub and CUD: Rich and Strange. Plus: Hey, Amateur!, Beat Surrender, previews and interviews with local street celebs in this compendium of comics, culture & cool. • Featuring a wraparound cover by Philip Bond! • Don't miss a special enhanced RI variant cover from Caitlin Yarsky (Coyotes)! • A new horror miniseries from Christopher Sebela (Hard Crimes, Hellraiser) and Shawn McManus (The Sandman, Fables)! • Don't miss a special, enhanced RI cover from Tony Sandoval (Doom Boy)! • Letter column, interviews, behind-the-panel process pages, and more! Fifty female trailblazers of yesterday and today get a four-color sequential tribute in Femme Magnifique. This collection features three-page short stories about women from the arenas of pop music, politics, art, and science. From astronauts and archaeologists to muckrakers and mathematicians, Femme Magnifique will stimulate and educate. Part mini biopic, part personal inspiration, this collection also features new material including a foreword by Cindy Whitehead, behind-the-scenes process pages, and more! Comic book luminaries Gail Simone, Kelly Sue DeConnick, Bill Sienkiewicz, Kieron Gillen, Sanford Greene, Jill Thompson, Gilbert Hernandez, Gerard Way, and Marguerite Bennett, to name a few, lend their talents to a celebration of kickass women who are truly magnifique. • A comic book anthology salute to 50 magnificent women who take names, crack ceilings, and change the game in culture, politics, art, and science. • The Kickstarter sensation that united over 100 comic book writers and artists from around the globe is now available in paperback with new content, including a new cover by Tess Fowler! • The residents of Bloom County are back to put their trademark tragi-comic spin on the horrors of the last year! • More new Bloom County! You can't run! You can't hide! 48 putrid pages of frightful, fiendish fun—in fact, put on your best red dress, HH fans, because your FUNeral is about to begin! A comprehensive series that remedies a gap in comics history, bringing back all the Superman Sunday strips—among the character's rarest collectibles—as co-creator Jerry Siegel returns to writing duties. In these 18 classic adventures from October 18, 1959, to January 20, 1963, the Man of Steel meets "The Kryptonite Girl" and his "Mermaid Sweetheart." Also featured are Superman's "Greatest Feats," "The Super Powers of Perry White," "The Invasion of the Super-Ants," and "The Creature of 1,000 Disguises," among other early '60s tales drawn by Wayne Boring. • 2018 marks the 80th anniversary of Superman's first appearance. • Xavier Fauthoux was the winner of the James Brown Music Video Challenge in 2012. • The Godfather of Soul, Mr. Dynamite, The Hardest Working Man in Show Business—a legend of popular music whose influence and appeal reaches audiences to this day—gets the graphic novel treatment. Opening with a 1919 death match between two American superhumans in the ruins of Utopia, the second issue of Alan Moore and Kevin O'Neill's final volume of the beloved comic series takes its readers on a breath-taking ride over a waterfall of storytelling styles, from a startling 21st century Lincoln Island and its current incarnation of the legendary Captain Nemo, through a New York coping with an ageing costume-hero population, to a London where a drastic escalation is commenced by the rejuvenated sociopath controlling MI5. All this, and a further reprinted adventure of 1960s super-team The Seven Stars, awaits in issue two of The League of Extraordinary Gentlemen Volume IV: The Tempest. • Co-Published by Top Shelf Productions (US) and Knockabout (UK). • The end of The League of Extraordinary Gentlemen! • 32 full pages of art and story! • Black and white variant cover by Kevin O'Neill! Diana got hurt—a lot—and she's decided to deal with this fact by purchasing a life-sized robot boyfriend. Mary and La-La host a podcast about a movie no one's ever seen. Kelly has dragged her friend Beth out of her comfort zone—and into a day at the fantasy market that neither of them will forget. Girl Town collects the Ignatz Award-winning stories "Radishes" and "Diana's Electric Tongue" together with several other tales of young adulthood and the search for connection. Here are her most acclaimed mini-comics and anthology contributions, enhanced with new colors and joined by brand-new work. Bold, infatuated, wounded, or lost, Nowak's girls shine with life and longing. Their stories—depicted with remarkable charm and insight—capture the spirit of our time. • Multi-award-winning cartoonist Carolyn Nowak (Lumberjanes) finds powerful truths in fantasy worlds. Her stunning solo debut collection celebrates the ascent of a rising star in comics. Inspired by Mary Shelley's immortal gothic horror tale, Frankenstein Alive, Alive brings new life to the Promethean monster, courtesy of Steve Niles (30 Days of Night) and Bernie Wrightson (Frankenstein, Swamp Thing). Victor Frankenstein's cobbled together creature continues his adventures, embarking on a journey to discover his own humanity. This collection includes the four-issue series along with an extended gallery section of never-before-seen layouts and pencils by Wrightson, all scanned from the original art. Additional art is supplied in the final chapter by Kelley Jones (at Wrightson's request), who stepped in to complete the series upon the comic book legend's untimely passing. • The monster lives! 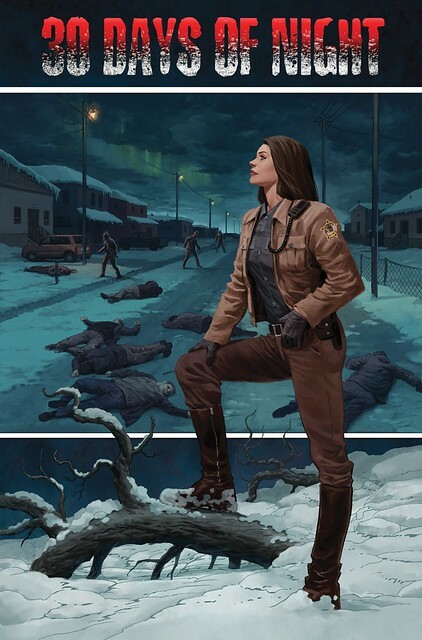 A stunning collaboration between the premier horror artist in comics history and the co-creator of the modern classic 30 Days of Night! Batman: The Animated Series—Gotham Under Siege has you and up to four of your friends playing as Batman and his trusted allies. Each round you'll face off against a set of story cards all inspired by the first season of Batman: The Animated Series, and roll a pool of dice to complete actions. You'll need to balance between cleaning up the streets of Gotham and completing story missions in order to protect the city. Let too many civilians fall or buildings be destroyed, and there will be nothing left for Batman to protect! Diamond Exclusive Pre-Order Incentive: Pre-order Batman: The Animated Series—Gotham Under Siege and you will receive an exclusive The Joker/Harley Quinn art print by TableTaffy with every copy! • Includes 5 highly detailed miniatures! • Game design from Richard Launius (Arkham Horror, Planet of the Apes)! • Features all-new artwork from TableTaffy! Midway's Joust brings the classic video arcade game to the tabletop in an action-packed, strategy board game. Requiring players to manage the speed and altitude of their knight, Midway's Joust features a unique momentum system that has players playing cards that immediately move their knight, but repeat effects for turns to come. Act quickly, but think ahead, because in the game of Midway's Joust, speed can be your greatest ally—or biggest foe. • Inspired by the hit classic arcade game! • Artwork from Martin Abel! • Artwork from TMNT co-creator Kevin Eastman! • 1000 snug fit pieces. • Made in the USA from recycled materials. Join Sonic the Hedgehog and his friends in assembling this challenging 1000-piece collector's puzzle featuring artwork by fan-favorite Tyson Hesse. Made in the USA from 100% recycled materials, IDW Games puzzles are built to last and suitable for framing. • Artwork from Sonic the Hedgehog animator and comic illustrator Tyson Hesse!